(0 Customer Reviews) | Write Review 52 issues per year Pick Me Up! stimulates the modern real-life reader with a rip-roaring range of fun, fascinating and thought-provoking stories which feed her curiosity and hunger to know more. It hits the sweet spot for value-hunting, brighter women. Pick Me Up! gets under the skin of the story and encourages its reader to think harder, feel deeper … and share the experience. Plus, Pick Me Up! has the most up-to-date fashion and beauty pages, easily digested health and wellbeing advice, a good portion of fab food news and recipes, and pages of prize puzzles, all in a bright, modern package. Pick Me Up! stimulates the modern real-life reader with a rip-roaring range of fun, fascinating and thought-provoking stories which feed her curiosity and hunger to know more. It hits the sweet spot for value-hunting, brighter women. Pick Me Up! gets under the skin of the story and encourages its reader to think harder, feel deeper … and share the experience. Plus, Pick Me Up! has the most up-to-date fashion and beauty pages, easily digested health and wellbeing advice, a good portion of fab food news and recipes, and pages of prize puzzles, all in a bright, modern package. 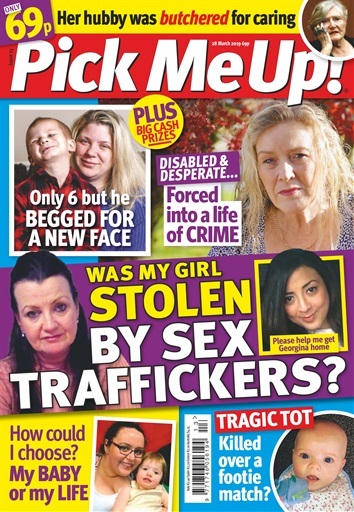 You'll receive 52 issues during a 1 year Pick Me Up magazine subscription. You'll receive 52 issues during a 1 year Pick Me Up magazine print subscription.